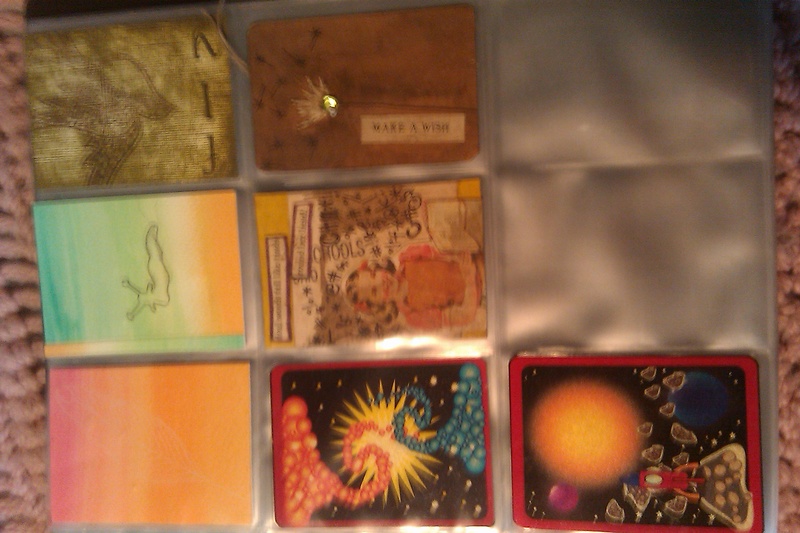 In March 2009, I first heard of Artists Trading Cards. I had not worked with very many mediums, and I didn’t know anything about craft, but it sounded like fun. I started with actual baseball cards and roughed up their finish with a quarter. I painted a coat of white poster and craft paint I got at the drug store where I got the cards. After this dried, I drew “magic” shiitake mushrooms in all different colors. If I do it again (which I hope to), I will start with card stock instead of altering a baseball card. The idea was cool, but they ended up bending and flaking. Now that I know more, I would also finish them with at least the Mod Podge spray to seal them. I had a lot of fun making them, though, and I hope to make more! I loved the cards I received, and felt bad because they were all so much better than mine, but they provided me with inspiration for the future!